A LOCAL ECO TAX OF €1.10 PER PERSON PER NIGHT COMES INTO EFFECT FROM JULY 1ST AND IS PAYABLE ON ARRIVAL IN IBIZA. This San Antonio villa comfortably sleeps 10 guests. Casa Maymo is a simply beautiful property. The villa is set in the hills with the most wonderful Mediterranean sea views and on a clear day you can even see the mountains of the Spanish mainland. The incredible sunsets you can enjoy from Casa Maymo ‘s stunning location are an experience you will never forget. The villa is very private but is just a 10 minute drive to San Antonio and a 25 minute drive to Ibiza Town. It is also a short drive to some of Ibiza s most beautiful beaches. The villa has five large double bedrooms and can sleep ten people comfortably. It has four shower rooms, an amazing sitting room and dining room and a state of the art modern kitchen. The Villa sits in 75000 square meters of its own land and is surrounded by rural paths in all directions which lead to typical Ibizan villages. 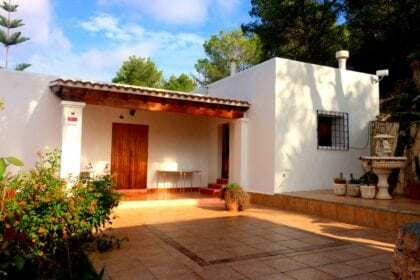 The villa is situated in Ses Fontanelles, part of Es Amunts, the most protected area of Ibiza because of its outstanding natural beauty and has its own Organic Vegetable Garden. Due to its fabulous location and grounds, Casa Maymo is also a wonderful choice for Wedding Ceremonies. Important information about your booking. Cleaning Charge > 4 bedroom villas at £135 per stay,5 bedroom villas £155 per stay,6 and 7 plus bedroom villas £175 per stay, added to your final balance payment. An Accidental Damage Waiver charge of £12.95 per person is added to the cost of your booking. Check-in time is 4pm on day of arrival. Check-out time is 10am on day of departure. You will not be able to access your villa before 4pm without prior arrangement. If you would like to utilise the air-conditioning (if it is available in your chosen villa) an additional charge of 20€ per day is payable. We can provide food and drink to be waiting for you at your villa. Click here for info! We can organise your airport transfers. Click here for info! A LOCAL ECO TAX OF €2.20 PER PERSON PER NIGHT IS CHARGED IN THE BALEARIC ISLANDS AND IS PAYABLE ON ARRIVAL IN IBIZA. Originally an ancient finca that was almost a ruin when the current owner bought it, Casa Maymo has been lovingly restored and renovated using only the highest quality materials. There are Sabina wood beams throughout, tiled and wooden floors, artisan stonework, antique asian artifacts and stylish, comfortable furniture which all create a harmonious and elegant property. The gardens are beautiful with large lawns overlooking the sea and there is a spacious terrace with table and chairs for dinning al fresco. The large swimming pool and wonderful chill out area allows ample space for relaxing and soaking up the sun. The views and sunsets are so spectacular, that you will not want to leave this beautiful villa. Casa Maymo is for those who want to completely chill, enjoy stunning views and experience staying in a wonderful villa, with the odd night out to dip into all that Ibiza has to offer. Have your own private caterer from Kumharas Catering www.kumharas.org . Kumharas is famous all over Ibiza for its food. You can now have it cooked and served to you by the Kumharas staff in the privacy of Casa Maymo for less than you would pay for a private chef.